Special events happen and we want you to be a part of them. Additionally, we are often lucky enough to host wonderful instructors as they teach clinics at the Painted Bar Stables. Please keep checking back and see if there's something coming up that you would want to be a part of. Painted Bar Stables will be hosting a fully catered 3 part seminar on equine liability and insurance. Understanding the laws and liabilities associated with horses is not just important for equine businesses, but for any horse owner. This seminar will be designed to help the everyday horse owner understand the laws, liabilities and customs that impact them and their horse. Whether you are a horse owner, boarder, rider, farm owner, or owner of an equine business it is important to know how to use the law and insurance to make good decisions and protect your horse, yourself and your investments. Do you know your responsibilities? Are you protected? Taking care of someone else’s horse? Plan to lease a horse? Looking to breeding your horse? Have you ever had a horse break loose? If your answer is yes to any of these questions then this is for YOU! Click here to download the flier for the event. Many horse owners are unaware of the liabilities associated with their horses and the need for insurance. 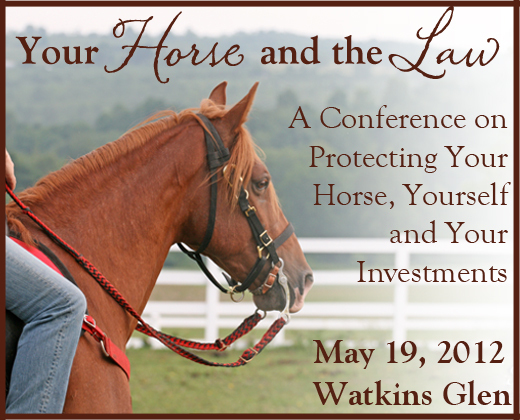 We will take a look at the types of liabilities that horse owners are presented with and the NY State laws associated with horse ownership. Do you know how to prepare and protect yourself financially? 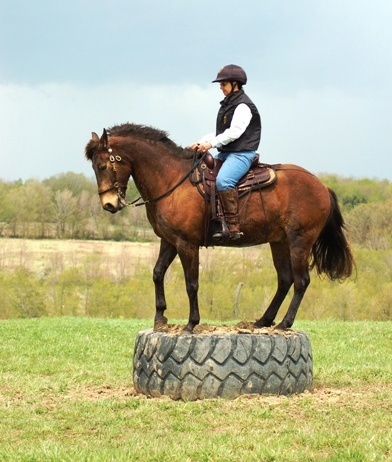 Learn how to set up your fiances and learn about tax laws as they relate to horses. The final session of the seminar will consist of breakout discussion groups where individuals can discuss and present questions on multiple topics. So you have horses, maybe a business, and there’s a lot on your plate. How can you bring it all together? Tim’s goal is to make high-quality financial planning services more accessible to working individuals and families. Use this opportunity to educate yourself on basics related to the main areas of personal finance, including the financial planning process, retirement, investments, estate planning, and insurance coverage. Host: Tammy Marsh, Palomino AcresEveryone needs to know what’s in a contract. Everyone needs to know what to expect. Gain perspective on etiquette and situations from both sides of the boarding contract. What are the normal issues that people run into when hosting boarders at their farm as well as what issues do clients usually have when boarding their horses? How important is pedigree and registration? How does overpopulation impact the equine economy? What makes someone a backyard breeder? Opportunity for equine professionals to discuss issues and successes in contracts, marketing and business plans, as well as discuss how businesses can impact the health of the local horse community. How much does it cost to own a horse? What vaccines and tests are needed for your horse? How often do I need to trim their feet? What kind of barn and pasture do I need? Where and how do I get hay, grain and other supplies? An opportunity for people to discuss the reality of selling and buying horses. The pathway to horse sales can be filled with obstacles. This group should look at techniques for looking at horses, ways to avoid deceit, costs associated with buying and selling, and proper conduct. 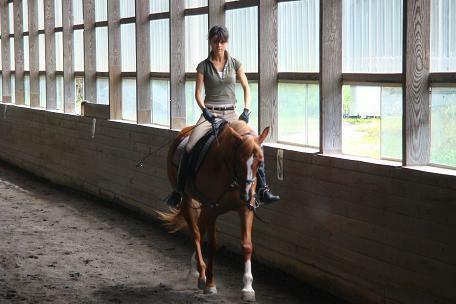 Painted Bar Stables will not be hosting any riding clinics in 2012. Please see this list for information on clinics at other local stables. Afterwards from 3:30pm - 4:00pm we will be hosting a free discussion for all participants and auditors. This discussion group will allow us to talk about what was learned at the workshop. Learn mounted police training techniques that encourage partnership and communication to achieve exceptional trust between rider and horse. Riders will work with their mounts in creative sensory and obstacle situations with the emphasis on introductory obstacle challenges using proven police horse training techniques. Riders are expected to have basic control of their horse, including the ability to walk, trot, turn, and stop their horse on command. Workshops may have up to 12 horses; riders should be comfortable riding in large groups and in pairs. Horses participating in the workshop should have some out-of-arena experience and be free of dangerous vices (i.e. kicking). Helmets and appropriate footwear are required for all riders. Auditors should feel free to bring their own chair for comfort while viewing. Joann Long, President of Gentle Dove Farm, is National Mounted Police and Toronto Police Services Certified. 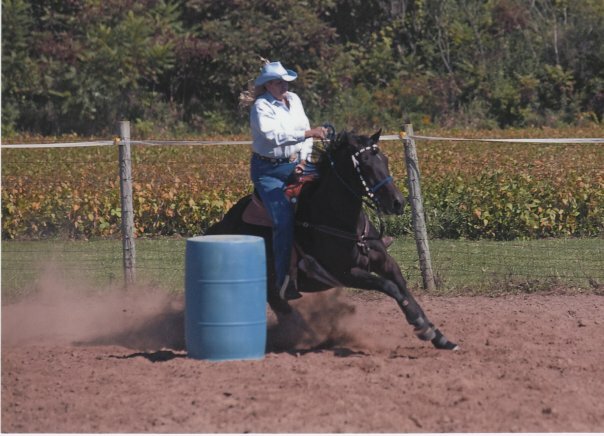 With over twelve years in the mounted police, Joann has plenty of police horse competition experience. She has successfully competed in international mounted police competitions and earned multiple Grand Champion titles at the North American Police Equestrian Championships, the Brigadier Memorial Champion Award for the top combined obstacle and equitation points with over 100 of the best international mounted police competing, and NYS Police Olympics Gold Medal winner 4 years in a row. Please remember that all registrations must be pre-paid. Spots can be requested but not reserved. You are not officially registered until payment has been received in full. If registration is cancelled, all money will be refunded minus a $15 cancellation fee. 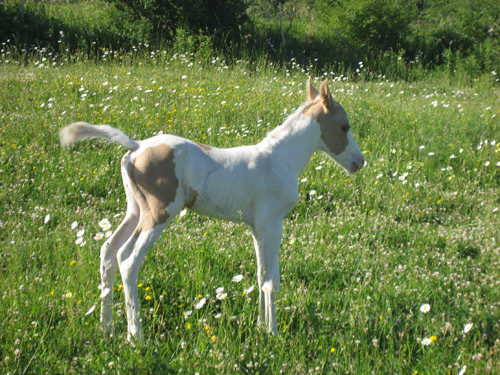 We have some baby foals that we would love your help in celebrating! On July 11 we will be throwing a big celebration and would like you to join us! Our first baby of the year was Pixie, born to Scotch on May 29th. 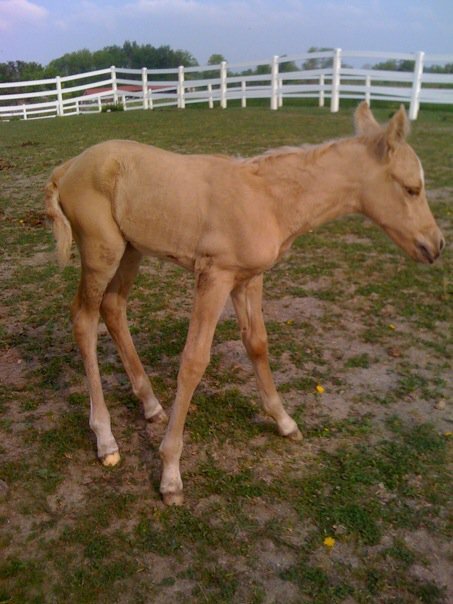 Pixie is a beautiful palomino dun. She has already been sold to Katie Steigerwalt. Our second baby was Cupid, born to Maxie on June 6. He is a spunky and gorgeous little palomino medicine cap and is offered for sale! We are still waiting on one more! Dutchess is due to give birth any day now. 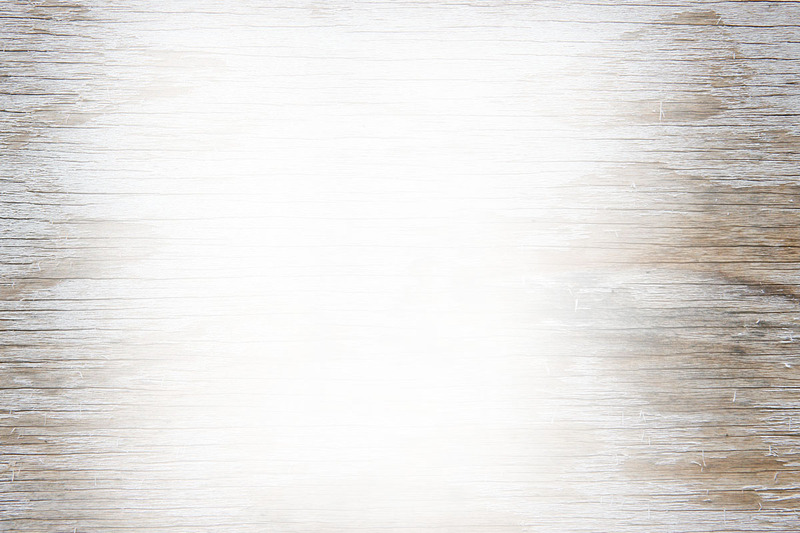 Be sure to check out our news section of our website for updates! At the party everyone will get to meet the new additions. We will also be offering $1 pony rides on Beauregard, Elmer Fudd and Pepsi for anyone (child or child-at-heart) and a free BBQ and dish to pass dinner snack. Kerry Motelson has been riding for more than 17 years in hunter jumper and hunt seat equitation. Starting in 2001, Kerry began training in Dressage under two- time Olympian Lendon Grey, and by 2002 she was competing internationally. She won the Northeast Junior Young Rider Dressage Championships in 2002 and 2003, and soon thereafter became Assistant Manager and Head instructor at Twin Birches Farm in Brewster, N.Y. She currently instructs in Northern Westchester.